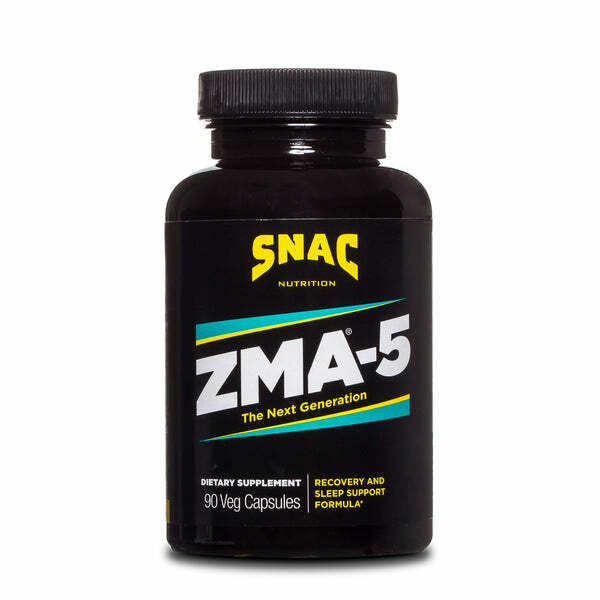 ZMA®-5 is the next generation in recovery and sleep enhancement supplementation. This innovative new formula combines ZMA® with the amino acid 5-hydroxytryptophan (5-HTP) to create a synergistic and highly potent combination of ingredients. The zinc, magnesium and vitamin B-6 contained in ZMA® are all three co-factors in the conversion of 5-HTP to the hormone serotonin, an important neurotransmitter that helps to regulate mood and sleep. A precise amount of folic acid has also been added to ZMA®-5 to further increase the bioavailability and conversion of 5-HTP to serotonin. The normalization of serotonin levels during sleep may help to elevate mood upon waking from a deep and restful sleep. The thermogenic absorption enhancer Bioperine® has been added to increase the overall potency and effectiveness. This novel ZMA®-5 formula provides all of the proven benefits of the precise dosages and ratios of the ingredients contained in ZMA® plus the added synergistic and powerful effects of 5-HTP to help establish the next generation of recovery and sleep enhancement supplementation. With my busy days, workouts and heavy traveling, proper rest was hard to come by. I love ZMA-5 because it gave me that deep sleep and rest I needed! This product is the best. I have been using it for years now and if possible I will keep on using for ever. For me the best thing about the product is the way it puts me to sleep and it also gives me a very deep and restful sleep which helps with recovery and potentially muscle gain. Love this product!